A Monster Calls is a 2016 dark fantasy tragedy film directed by J. A. Bayona and written by Patrick Ness, based on his novel of the same name. The film stars Sigourney Weaver, Felicity Jones, Toby Kebbell, Lewis MacDougall, and Liam Neeson, and tells the story of Conor (MacDougall), a child whose mother (Jones) is terminally ill; one night, he is visited by a monster in the form of a giant anthropomorphic yew tree (Neeson), who states that he will come back and tell Conor three stories. The film is an international co-production between Spain, United Kingdom and the United States. A Monster Calls premiered at the 2016 Toronto International Film Festival on 10 September 2016. It was then released in Spain on 7 October 2016, and in the United Kingdom on 1 January 2017. In the United States, the film began a limited release in on 23 December 2016, followed by a wide release on 6 January 2017. It received positive reviews, being praised for its themes, directing, performances and visual effects, but underperformed at the box office, grossing $47 million worldwide on a budget of $43 million. Connor, (Lewis MacDougall) is a 13-year-old boy who, after separating from his parents, becomes the man of the house and the one in charge of running the household. With his young mother (Felicity Jones) sick, the child will try to overcome all their fears and phobias with the help of a monster (Liam Neeson). Fantasy, fairy tales and imaginary stories of the little one will be seen not only with reality, but with their cold and calculating grandmother (Sigourney Weaver). With this new work J.A. Bayona will close a trilogy on mother-child relations, which began with the orphanage and continued with the impossible. An old king who has lost his entire family (with his sons killed in fierce battles and his wife committing suicide in her grief) save a young grandson, remarries a beautiful young woman. He dies before the prince comes of age, and many believe the queen poisoned the king. Not wanting to hand the kingdom over to the prince in a year, she plots to marry the prince and remain queen. The prince runs away with a farm girl he loves. They stop and sleep under a yew tree (the Monster), but in the morning he finds the young woman murdered. The prince tells the villagers that the queen, a witch, must have done it, and they rally to overthrow her. Before the commoners can reach the queen, the Monster carries her away to a far-off land where she lives out the rest of her life in peace. Though she was indeed a witch, she did not kill the farm girl or the king, who actually died of old age. The prince had murdered the farm girl himself in order to inspire his people to back him into overthrowing the queen. After the queen was taken to safety by the Monster, the prince continued to rule the kingdom in the grandfather's place. An apothecary follows old traditions and beliefs, using herbs and brews to cure ailments. His business becomes less popular as a local parson tells his congregation not to accept the apothecary's old ways and denying the apothecary use of an old Yew tree. When the parson's two daughters become sick, the parson asks the apothecary to save their lives after all other resources are exhausted. When the apothecary asks why he should help a man who has turned people away from his skills and denied him the yew tree, his best source of healing ingredients, the parson promises to give him the tree and deliver the parishioners to him as customers. Yet the apothecary says that he cannot help, and the girls die. The Monster awakens from the yew tree to destroy the parson's house and raze it to the ground as punishment. While the apothecary was a greedy man, he was a healer and would have saved lives, including the girls', if the parson had allowed him his way of life. The parson was a man of belief but was willing to discard his beliefs when they were in the way. The healing traditions followed by the apothecary require belief in order to work; without the parson's, the apothecary was unable to treat the two girls. Belief is half the cure. A man was invisible because no one ever saw him. Tired of this, he summoned the Monster to ensure people would notice him. Though people now notice him, the man finds himself more alone than before. Conor must confront his nightmare to tell the fourth story. His mother has been pulled to the edge of a cliff by a sudden collapse of the ground, and Conor must hold her hand to save her from falling. Eventually, his grip fails and his mother falls. The Monster forces Conor to confess the truth: Conor loosened his grip on purpose. While he could have held on longer, he let go in order to stop the pain of having to hold on. Through the Monster, Conor ultimately understands that although he does not want his mother to die, it is something he must accept, and he must not feel guilty for wanting it to be over so he does not have to feel pain anymore. After this, Conor returns, with the Monster by his side, to comfort his mother one last time, and she dies at 12:07. He returns home with his grandmother, with whom he has reached an understanding, and she gives Conor the room that used to be his mother's. In the room, he finds his mother's old art book, which depicts the stories that were told to him by the Monster, and a drawing of his mother as a child with the Monster. Liam Neeson as the "Monster" (voice and motion capture), a giant humanoid yew tree. Neeson also appears uncredited in a photograph as Connor's grandfather. Tom Holland, who worked with Bayona on The Impossible, served as the stand-in for the Monster during one week of production. Sigourney Weaver as Mrs. Clayton (credited as "Grandma"), Conor’s strict grandmother who has a tense relationship with him. Felicity Jones as Elisabeth "Lizzie" Clayton (credited as "Mom"), Conor’s mother who is diagnosed with an unspecified terminal illness. Toby Kebbell as Liam O'Malley (credited as "Dad"), Conor’s father who is divorced from Lizzie and now lives in the United States. James Melville as Harry, a school bully who frequently targets Conor. Geraldine Chaplin as the head teacher of Conor’s school. Focus Features bought the rights to the book in March 2014. Patrick Ness, the book's author, served as the film's screenwriter, with J. A. Bayona hired as director. On 23 April 2014, Felicity Jones joined the film to play the boy's mother. On 8 May, Liam Neeson was cast to voice the Monster, and on 18 August, Sigourney Weaver joined to play the boy's grandmother. On August 19, Toby Kebbell was also cast in the film. On 3 September, author Ness tweeted that Lewis MacDougall had been set for one of the lead roles as the boy in the film. On 30 September, Geraldine Chaplin joined the cast. Liam Neeson, who voices the titular tree creature, was not on set throughout the shooting process, and completed his motion-capture performance during a two-week period beforehand, with MacDougall in the room. Tom Holland worked on set as The Monster with Neeson absent. Originally scheduled for an October 2016 release, the film was delayed in order to avoid competition from Jack Reacher: Never Go Back, Boo! A Madea Halloween, Ouija: Origin of Evil, and Keeping Up with the Joneses. It was rescheduled for a limited roll out on 23 December 2016, followed by a wide release on 6 January 2017. The film was released in the United Kingdom on 1 January 2017, by Entertainment One and Lionsgate, and in India on 6 January 2017, by B4U Relativity. A Monster Calls grossed $3.7 million in the United States and Canada and $43.5 million in other territories for a worldwide total of $47.2 million, against a production budget of $43 million. In North America, the film had its wide release alongside the opening of Underworld: Blood Wars and the wide expansions of Hidden Figures and Lion, and was initially expected to gross around $10 million from 1,523 theaters over the weekend. However, after making just $659,000 on its first day, weekend projections were lowered to $2 million, which it ended up grossing, finishing 13th at the box office. In its second weekend of wide release it grossed $537,262 (a drop of 74.2%) and in its third week made just $19,080 (a drop of 96.4%) after being pulled from all but 42 theaters, one of the biggest third week theater drops in history. The aggregate site Rotten Tomatoes gives the film an approval rating of 86% based on 249 reviews, and an average rating of 7.5/10. The site's critical consensus reads, "A Monster Calls deftly balances dark themes and fantastical elements to deliver an engrossing and uncommonly moving entry in the crowded coming-of-age genre". At Metacritic, the film has a weighted average score of 76 out of 100, based on 40 critics, indicating "generally favorable reviews". Audiences polled by CinemaScore gave the film an average grade of "A" on an A+ to F scale. ^ "A Monster Calls (12A)". British Board of Film Classification. September 23, 2016. Retrieved September 23, 2016. ^ a b c "A Monster Calls". Toronto International Film Festival. Retrieved 19 February 2017. ^ Browne, Kit Simpson (15 September 2016). "Patrick Ness Explains Why 'A Monster Calls' Is Going To Make You Cry". Archived from the original on 2016-10-10. Retrieved 13 October 2016. 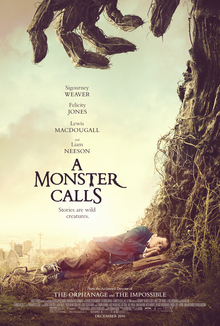 ^ a b c "A Monster Calls (2016)". Box Office Mojo. Retrieved 5 April 2017. ^ Schwerdtfeger, Conner (24 September 2016). "The Strange Role Spider-Man Star Tom Holland Plays in 'A Monster Calls'". Cinemablend. Retrieved 24 September 2016. ^ Fleming, Mike. "Focus Features Makes $20 Million Deal For 'A Monster Calls' Movie". Deadline Hollywood. Retrieved 9 April 2014. ^ "Focus Dates 'A Monster Calls' For October 2016". Deadline Hollywood. Retrieved 9 April 2014. ^ "Felicity Jones To Star In Juan Antonio Bayona's 'A Monster Calls'". deadline.com. 23 April 2014. Retrieved 24 April 2014. ^ McClintock, Pamela (8 May 2014). "Cannes: Liam Neeson Joins 'A Monster Calls'". hollywoodreporter.com. Retrieved 10 May 2014. ^ "Sigourney Weaver Joins High-Profile 'A Monster Calls'". The Hollywood Reporter. ^ "'Fantastic Four' Actor Toby Kebbell in Talks to Join 'A Monster Calls'". Variety.com. ^ Espina, Alfonso (4 September 2014). "Lewis MacDougall to Lead Adaptation of Patrick Ness' 'A Monster Calls'". upandcomers.net. Retrieved 1 October 2014. ^ a b "Three Join 'A Monster Calls'". Deadline Hollywood. 30 September 2014. Retrieved 1 October 2014. ^ "'A Monster Calls' Begins Production". participantmedia.com. 30 September 2014. Archived from the original on 3 October 2014. Retrieved 1 October 2014. ^ "Production Begins on A Monster Calls, Starring Liam Neeson". ComingSoon.net. 30 September 2014. Retrieved October 1, 2014. ^ "Hollywood film begins filming in Preston". lep.co.uk. 9 October 2014. Archived from the original on 11 October 2014. Retrieved 10 October 2014. ^ Ashley Lee (8 December 2016). "'A Monster Calls' Speaks to Both Kids and Adults, Says Sigourney Weaver". The Hollywood Reporter. Retrieved 27 December 2016. ^ "Focus Features Sets A Monster Calls for 14 October 2016". ComingSoon.net. Retrieved 9 April 2014. ^ Anthony D'Alessandro (1 June 2016). "'A Monster Calls' A Week Later In October". Deadline Hollywood. Retrieved 2 June 2016. ^ D'Alessandro, Anthony (29 August 2016). "Focus Features' 'A Monster Calls' Dials Up Christmas Weekend Release". Deadline Hollywood. Retrieved 30 August 2016. ^ Lloyd, Kenji (19 June 2016). "A Monster Calls UK Release Date Set for January, The Tree Awakens on First Poster". Final Reel. Retrieved 30 August 2016. ^ "A Monster Calls India Trailer". YouTube. ^ "'Hidden Figures' is likely to draw crowds as 'Rogue One' stays on top of the box office". Los Angeles Times. ^ "Uni/Blumhouse's 'Split' Is A Hit With High $39M To $40M+; 'Xander Cage' Falls Down". ^ "Biggest Theater Drops". Box Office Mojo. ^ "A Monster Calls (2016)". Rotten Tomatoes. Fandango. Retrieved 23 January 2017. ^ "A Monster Calls Reviews". Metacritic. CBS Interactive. Retrieved 23 January 2017. ^ CinemaScore on Twitter (6 January 2017). "A Monster Calls". Retrieved 1 June 2017. ^ Rahman, Abid (15 December 2016). "Denzel Washington's 'Fences' Leads Nominations for AARP's Movies for Grownups Awards". The Hollywood Reporter. Retrieved 26 December 2016. ^ "Camerimage 2016 Main Competition Line-up!". Camerimage. 24 October 2016. Archived from the original on 29 October 2016. Retrieved 11 November 2016. ^ "La La Land Leads with 12 Nominations for the 22nd Annual Critics' Choice Awards". criticschoice.com. Critics' Choice. 1 December 2016. Retrieved December 1, 2016. ^ Graham, Adam (14 December 2016). "Local critics: 'Moonlight', 'Manchester' best of 2016". The Detroit News. Retrieved 15 December 2016. ^ Nugent, John (19 March 2017). "Three Empire Awards 2017: Rogue One, Tom Hiddleston And Patrick Stewart Win Big". Empire. Retrieved 19 March 2017. ^ Moore, William (17 November 2016). "Evening Standard British Film Awards - The Longlist". London Evening Standard. Retrieved 29 November 2016. ^ "Guardonades - IX Premis Gaudí". Academia del Cinema. 29 January 2017. Retrieved 3 March 2017. ^ Rolfe, Pamela (14 December 2016). "Juan Antonio Bayona's 'A Monster Calls' Leads Goya Award Nominations". The Hollywood Reporter. Retrieved December 16, 2016. ^ "La lista completa de ganadores de los premios Feroz 2017" (in Spanish). El Huffinton Post. 23 January 2017. Retrieved 25 January 2017. ^ "2016 San Diego Film Critics Society's Award Nominations". 9 December 2016. Retrieved 9 December 2016. ^ "San Diego Film Critics Society's 2016 Award Winners". 12 December 2016. Retrieved 12 December 2016. ^ McNary, Dave (2 March 2017). "Saturn Awards Nominations 2017: 'Rogue One,' 'Walking Dead' Lead". Variety. Retrieved 3 March 2017. ^ "2016 StLFCA Annual Award Nominations". St. Louis Gateway Film Critics Association. 12 December 2016. Retrieved 12 December 2016. ^ "The 2016 WAFCA Awards Nominations". 3 December 2016. Retrieved 4 December 2016.